The commander, executive officer and the senior enlisted sailor of the guided missile destroyer USS James E. Williams (DDG-95) have been removed of their commands ahead of an “investigation into the command climate,” aboard the ship, according to a statement issued Tuesday evening by U.S. Fleet Forces Command. Williams’ commander — Cmdr. Curtis B. Calloway — was replaced at sea on Tuesday at the half way point of the ship’s planned eight month deployment to U.S. 6th Fleet by Capt. Anthony L. Simmons from the staff of Destroyer Squadron (DESRON) 2, according to the release. In addition to Calloway’s removal from command, the former Williams’ XO Cmdr. Ed Handley and Command Master Chief Travis Biswell have been reassigned to the staff at Naval Surface Force Atlantic, “pending the outcome of the investigation,” said Fleet Forces. Removing the three positions — commander, XO and CMC — almost all at once is exceedingly rare. May 31, 2014 photo of Cmdr. 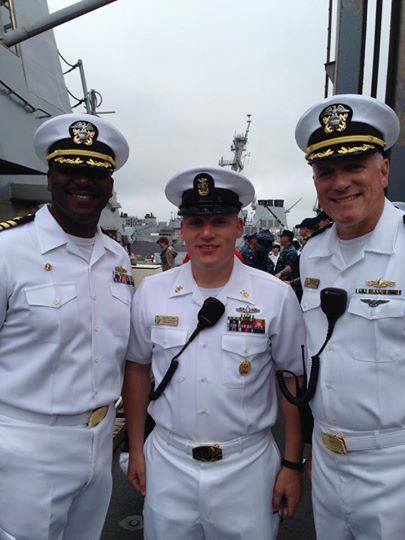 Curtis B. Calloway, CMC Travis Biswell and Cmdr. Ed Handley from the ship’s ombudsman Facebook page. No other details of the investigation were available and calls placed with Fleet Forces representatives were not immediately returned to USNI News. 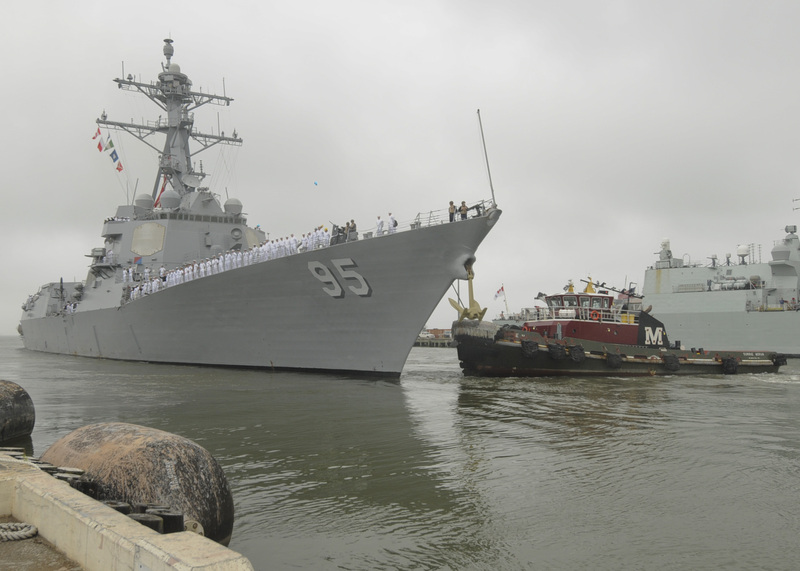 Williams’ had left Naval Station Norfolk, Va. on May 30 for an eight month partner navy engagement mission is U.S. Africa Command — typically undertaken by smaller Oliver Hazard Perry-class frigates. “It’s been a very long road for my crew,” Calloway told the Navy Times in May. It was the first deployment for around a 100 sailors — almost a quarter of the 380 person crew. A third of the sailors only reported to the ship two months before the ship left, according to the Navy Times. Calloway had previously served in destroyers as the engineering officer on USS Barry (DDG-52) and a 27-month tour as executive officer of USS Gonzalez (DDG-66), according to an official Navy bio. Onshore tours included time as the Antiterrorism/ Force Protection Officer at Commander DESRON 2 and Naval Surface Fire Support section head in the Surface Warfare division of the Office of the Chief of Naval Operations (OPNAV). Before taking command of Williams’, Calloway was, “Surface Warfare division of the Commander, Operational Test and Evaluation Force, where he was the Operational Test Director for the DDG-1000 program and a Special Projects Officer,” read the bio. USNI News was unable to locate an official bio for former XO Handley. CMC Biswell enlisted in 1999 and, “has completed two Atlantic and four Pacific deployments on three ships with both surface and amphibious forces,” according to his bio. AT SEA – Capt. Anthony L. Simmons relieved Cmdr. Curtis B. Calloway as commanding officer of the guided-missile destroyer USS James E. Williams (DDG 95) at sea Sept. 16. Simmons arrives from the staff of Commander, Destroyer Squadron (DESRON) 2 and will remain in command pending the completion of a DESRON 2 command-directed investigation into the command climate . Calloway, former James E. Williams Executive Officer Cmdr. Ed Handley, and Command Master Chief Travis Biswell have been assigned to the staff at Commander, Naval Surface Force Atlantic pending the outcome of the investigation. The ship and her crew departed Naval Station Norfolk May 30, for an eight-month deployment to the 6th Fleet area of operations. While there they have been participating in security operations, exercises, and combined cooperation (foreign nation) operations in conjunction with U.S. Africa Command.